Larry Newell is a Shelbyvillian snowboarder. 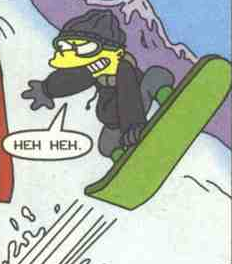 Larry competed in the final of the Ultra-Extreme Mega-Downhill Snowboarding Competition at the C. Montgomery Burns International Games (also known as Montgomery Burns Games). The sporting events that took place beforehand led to a near tie between Shelbyville and Springfield, meaning that the race Larry took part in would decide which town was the winner. Larry's opponent was Bart Simpson who was unfazed by Larry because of his "dorky" appearance. However, Larry secretly unscrewed the binding on Bart's snowboard, causing Bart to fall off during the race. Mr. Burns, Bart's trainer, took over from Bart and was able to beat Larry. Modified on January 4, 2017, at 19:32.